As a BNI MN member and webmaster that generates leads and business inquiries from websites, I make a habit to visit BNI chapters eager to grow across the world (currently visited a BNI chapters in Hawaii). I have spoken, learned from and mentored other BNI growth coordinators on using digital and the BNI meetup members to automate systems to expand their chapter. We've shared what works and what doesn't work through time-intensive trial and error. From these meetings of growth coordinators, I am sharing 7 Free BNI resources and strategies that your BNI chapter can use to rapidly expand and you should to Increase Your chapter's BNI Membership . Its been a pleasure to be part of BNI for the year of 2018. My name is Jake Goss-Kuehn, and I've grown my business over 200% with over 90% of my clients BNI MN members. As a business owner, I doubled my revenue and have gotten many more customers through the BNI sales process. When I started using the BNI systems for growth within my own business, I started growing. There is immense wealth for digital marketers in BNI, and I want to share that with you in this 12 minute blog post rich in resources, freebies, and more. But still, after visiting tens of BNI chapters in MN, I see a common and unorganized trend. The chapters that grow have a system, and continue their habit to grow even when they hit numbers they're comfortable with. How your Digital guy should build you a Unique BNI website, and how you can quickly model one using a template. I post regular content very often as well as interview BNI MN businesses on our youtube channel and digital strategy podcast. Get personally notified when we publish something amazing. Right, so use these tips to grow a BNI Chapter. 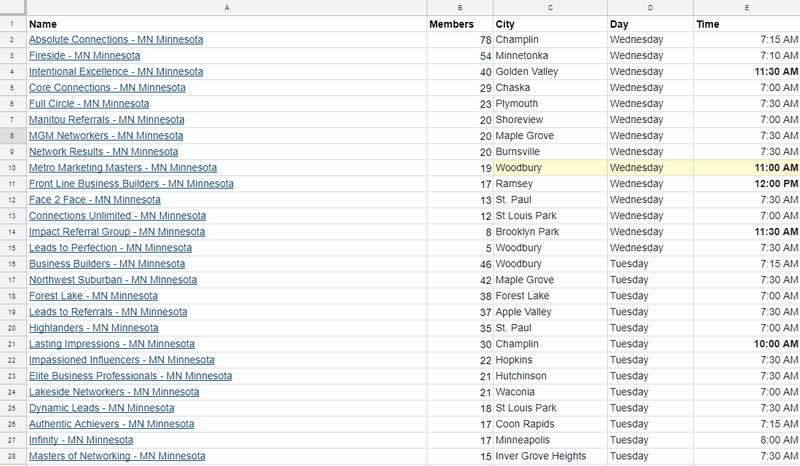 This is a spreadsheet of the BNI MN chapters in Minnesota, Wisconsin, and Hawaii. Feel free to make a copy by going to File and selecting Make Copy. You can use this spreadsheet to identify the size of a chapter, when they meet, and there is a quick link to their BNI MN website so you can see who else is in the chapter. I use this, and write down if there are any BNI digital marketing or BNI SEO companies, and I try and visit a chapter each week. You can do the same and find people that can work with you due to a lack of a supply in that existing network. Why this list of BNI MN chapters wasn't made before, I don't know. But enjoy! During your annual BNI leadership training, digital strategy and how to use digital is 100% ignored. There was no Webmaster or Digital BNI training for Social Media Coordinators during the 2018 BNI . You're taught and trained to make sure your BNI members attend meetings, and to paarticipate. But when it comes to growing your chapter using best practices, digital marketing gets ignored. This is a link to the BNI MN events on the BNI Connect website. Tell me where you can learn how to effectively learn digital, and I promise you it'll just be a how to use the BNI MN connect website or mobile app. It makes sense though. Digital marketers can be 100% location independent and BNI is a concrete and local meetup group. I'm writing this post out of a Hawaiian starbucks, after a Honolulu SEO discussed ideas for their BNI HI chapter that will likely never get used because he uses digital to attract business and not in-person relationships which is what BNI is founded on. There is a clear disconnect. He got his base of clients and left, and gets clients through digital marketing but even as he is his own proof of concept, BNI groups refer him work but not to grow their own BNI chapter. Each seat to a BNI chapter is worth tens of thousands of dollars. The Givers Gain Global chapter in MN has a dozen members, but averages $20,000 per seat. So, BNI works. If you work it. As a BNI SEO, aka someone that does Search Engine Optimization, I'm clearly going for the keyword phrases that get this post read. You're reading it, through whatever platform that came from. If you're not working the system, by sharing and providing value. Using BNI isn't the best outcome for you. I print detailed 12-page reports of business websites before I attend a new chapter. So in the spirit of givers gain, I'm our groups "Google Guy" and Web Developer thirsty to provide for our chapter. I'm the member in the group that loves digital anything and knows its value. So, I had built the BNI MN chapter so our chapter at Givers Gain Global had a website at outside of BNIMN.com… We called it the same but reverse. So when I say we own Minnesota BNI dot com, we get supreme authority. Heres our BNI MN Chapter Website if you wanted to see how its ended up. It took less than an hour to make, and we've shown exactly to get a website like this made within hours, on free webinars posted on the Web Strategy Viking Youtube channel. No excuses. It'll cost $10 and an hour or two to make something that'll just be a unique and centralized hub. Members that understand the impact, can post their own content on it which is a limitation on the current BNI MN web site, post reviews, or guide web visitors with pop ups and new pages to get RSVP and commit to visiting. You can 100% own and manage the entire website. Making a chapter website off the BNI MN website lets you control the effectiveness of your own growth. You can control how this gets seen – and you can basically do whatever you want with it. Obviously you should still vet visitors and make sure they show up after they filled the visitor form. Our chapter has had people come to it when we were doing a full day of BNI MN training. We expected no visitors – but whatever its a good problem to have. Its internet work like this thats collecting visitors that give us results such as a visitor as excellent as a bookkeeper to visit and be enthusiastic in joining our chapter within a week. This was in my spare time, and I'll be growing it with posts like these. We've covered this in full in our 77 sales and prospecting tips for business owners. Repurposed to bring in BNI MN visitors, you can just call a list of business owners and ask them if they're in a spot to grow their business. Its just a 60 second call at first. Spending 1 hour per week should produce 5 RSVPs per member with maybe 2 or 3 people to show up. Keep everyone active, and use the same centralized excel spreadsheet. Here is our spreadsheet. We collect use this BNI visitors tracker all on the same spreadsheet. Our better Sales team has different 60-second calls using the Sandler Sales method to bring in opporunity. Any member, regardless of skill, can prospect to grow their BNI chapter using outgoing calls. So use this to prevent your Minnesotan BNI chapter from falling apart. You want to focus your efforts to grow your chapter and more time to provide the sales. With transparency, you can see who is working on who, and see when you called them last and make sure they get the regular touch downs. Super great and hard work – and not something BNI wants you to do as you're not conducting the meeting per their standards. But your business and the members' businessess should come first – not BNI. Its your networking group. Spend your chapter's time to grow your chapter. Members sacrifice their sales, for long term growth. If business owners don't set time aside, or even as a weekly event to call and do outreach this way, then they'll get the same standard subpar results every other chapter gets. Its virtually a checklist to grow your chapter using visitor days. Depending on the quality and drive of the team, you can have a visitors day, attract your ideal members, and grow your chapter to three times as many guests and present your BEST 60-second commerical. 1) Start a networking meeting with members bringing their digital devices, rolodex, business cards or phones and the full time set aside to grow their chapter over four meetings. You can ask us to download a list of an industry and the business owner's contact information of the direct phone information. Imagine you make 60 dials in 60 minutes. It takes 10 seconds to dial. You'll hit voicemail or a gatekeeper 50% to 75% the time, but you'll get to 30 of them for sure. Calling them, asking them if they're in a spot to grow is all you need to determine. They'll ask how, and you're just setting time aside to learn about their business, and if they are open to networking with you so they can be introduced to dozen or so other business owners in their network. Good morning, this is Jake Goss with BNI. Typically, when I call, people give me one of two objections. Sometimes they just tell me that they're already working with someone or already happy with who they are working with. Can we just take both of those, put 'em on the side for a second and have a conversation regarding your situation and the outcomes that you're getting? If there's any opporunity to help great if not, we're fine with that as well. Could we take 3 to 5 minutes to have that conversation before we do anything else? Hey is this Bob? This is Jake from Giver's Gain Global. I take it that you weren't expecting my call. Do you have 30 seconds so I can tell you why I called? Bob, Listen. There is a south metro BNI business owner networking event on Tuesday. I'd appreciate if you have 60 seconds later to see if networking with me and 15 others in a local BNI chapter would make sense for you on a Tuesday, December 4th morning. Y: I'll send details shortly. N: I understand that, is it a timing issue or is this not a good time to grow your business? 3) Longer, Qualifying BNI call that you'd use if they are warmer to your call. Hi bob, its Jake. Lets take 5 min so we can see if networking is ideal for you. . Can I ask you 5 quick questions while I take notes? At the end we'll determine if a mutual fit is there not. Fair? Its is just these few questions. Would you like it to help more? Do you have $500 to invest in your Business's sales pipeline? OK BASED ON EVERYTHING YOU JUST TOLD ME. WORKING TOGETHER SEEMS LIKE A PERFECT FIT. Would you like to have an one hour consulting call with our digital strategist? To determine exactly where you're missing out and how you start getting sales from digital? NO: Thats OK. Usually, these are complementary for potential clients like yourself. Should I book a call. Get a confirmed member to have an address setup on the maps page at this offical page. Google sends an envelope to confirm the address, so if you can set up a pin on the map with the name of your chapter you can have a clear and centralized Google presence. Your members can simply post reviews, upload photos, and you can use that as a selling point easily. IF your chapter has 0 reviews, and other chapters have at least 1. Guess who takes that into consideration. Great. Share this post with your network of BNI members so they can read what this BNI marketing firm taught you to help grow your networking event secure more visitors, members, and ultimately more sales. Feel free to use this to get your marketing event much more exposure and growth. Wishing you the best of luck. OMG – I’m the Marketing Director for my BNI Thank Goodness It’s Wednesday chapter in Burlingame, California. I’m so excited to put these ideas in motion. You’re absolutely right that there’s so little info and training about outbound marketing for BNI. I’m hoping to chat with my Exec. Director about improving that.